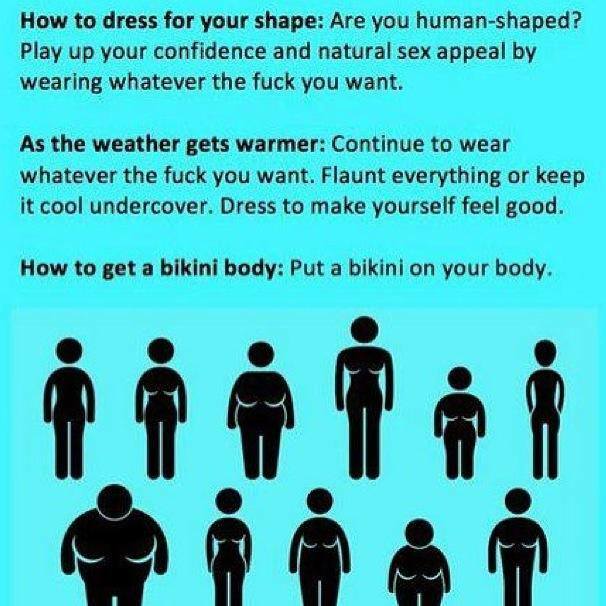 It’s a nice idea, but in a world where “the clothes make the man (or woman)”, it’s just not entirely practical to wear whatever in the eff you want, whenever you want, in spite of how it fits or what true messages it conveys. People think they are being individualistic or letting their personality shine or showing confidence with some of the unflattering things they wear, when in reality, they are letting their clothes define them and allowing their true selves to be buried under their latest fashion concoction. In other words, if one wears things that don’t flatter them, people tend to see the clothes (or lack thereof) instead of the person. So there’s my two cents. I agree, if you are a CEO, you will be perceived as being more respectable and trust worthy in a business suit, than in jeans and a polo shirt, even if the suit is more ill-fitting than the jeans and shirt would be. Does it change how do business if you choose to wear to work because you are more comfortable than in a suit, no. But let’s be honest, how you are now perceived in knowing your business does change and it does matter and thus the suit. Even many of those in the creative fields, where the rules of dress are very open, will attire themselves in a way more ‘suited’ to the situation, when conducting certain business transactions. We all understand that it is not necessarily fair or practical, or that matter makes sense, it is just the way of business perception. However, where I disagree is in wearing what’s flattering. What is flattering on a person is akin to the adage of beauty being in the eye of the beholder. It is very subjective. Let’s go back in time and check out Cher’s infamous feathered concoction or the swan dress worn by Bjork at the Academy Awards in different years. Both outfits were considered “flattering” to the respective woman, but inappropriate to the occasion. Uh, it was the Oscars, the epitome of the art of movie making – a place where one would think individualism and being different would be celebrated. Yet both women were mocked for being just that – different. There is some mystical point you’re “allowed’ to color outside the lines before the one’s individualism becomes something bane to the sensibility of another. But who gets to decide that line? Using the recent mini fashion storm with Gabourey Sidibe and the gown she wore at the Golden Globe being the perfect example. Gabourey wore what she wanted showing her individuality. Some loved what she wore and said it fit well. Others hated it and said she could have worn something more ‘flattering’. The same arguments pro and con were made of Melissa McCarthy’s gown. The only persons whose opinion were correct in either case were Gabourey and Melissa’s. Here is where the point of the post would be truly tested: Lady Victoria Hervey wore a body conscious gown to the Golden Globes after party where the world could see she was naked underneath. Now Imagine the firestorm that would have erupted had either McCarthy or Sidibe decided she wanted to wear something any where near as sheer and/or revealing. They would not do so because they are very much aware that the fashionistas and especially Twitter would eviscerate them. The issue becomes a) why they will be taken to task for doing the same and b) who are the hell are those who would take them to that task are in the first place to be able to do so with impunity? First of all, I didn’t see the Golden Globes, so I’ve no idea what Gabourey or Melissa wore. Suffice it to say they’re both super hot! Otherwise, all my life I’ve worn whatever I wanted to, knowing that due to the cyclical nature of style, I’d probably be “in” at least 25% of the time by changing nothing at all. I’m 63 and I fondly look back to the time when a man, at least, could go to a department store to buy slacks without having to be bothered with designer labels. Clothes was always a “nag” subject with my father, who seemed to wear a suit and tie far more often than was necessary. On a related subject, why do women allow their clothing styles to be dictated by gay men, whose attitudes towards women more often than not range from indifferent to hostile? A) Not all clothing designers are hostile, indifferent or gay men, don’t generalize. B) It’s human nature to want to either differentiate from or blend in with others. Clothing is one of the easiest ways to express oneself. So for the billions of people who do not have the talent, time or funds to create their own clothing who else, but a designer/tailor/seamstress to create clothes for us to express that? C) It’s not just women, men who choose to be fashionable, or far that matter to not be so, are just as much dictated to, ergo… D) We’re all dictated to in our clothing choices or lack of choices in some fashion regardless.